It is my great pleasure to be here with you today in the Franco-Ukrainian Forum. Just yesterday, the Prime Minister and I renewed the OECD-Ukraine Memorandum of Understanding, reflecting our continued determination to work together to address Ukraine’s reform priorities. We have agreed on three interrelated areas for further co-operation: (i) tackling corruption; (ii) strengthening public governance and the rule of law; and (iii) improving the investment and business climate. 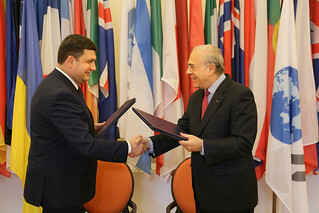 27 October 2016 (left to right) Volodymyr Groysman, Prime Minister of Ukraine, and OECD Secretary-General Angel Gurría, OECD, Paris. Within this framework of co-operation, and thanks to the financial support of some of our Members, the OECD has been able to play an important role in shaping Ukraine’s reform agenda and contributing to its recent transformation. Ukraine’s economic situation is challenging. Real GDP fell by almost 16% over two years, and it is expected to grow weakly with an estimated 1.5% this year and a projection of 2.5% in 2017. Not surprisingly, against the backdrop of political crisis and deteriorating terms of trade, foreign direct investment inflows to Ukraine have been volatile. In 2014, FDI inflows fell by more than 90%. Last year, they bounced back, rising to just over 3 billion USD – still a fairly low level by the standards of the recent past. 2016 is expected to see even higher flows. Domestic consumption remains depressed, the external economic environment is difficult, and Ukraine’s eastern regions continue to experience armed conflict. Public finances remain under stress despite an impressive fiscal adjustment in 2014-15. Nevertheless, there is a positive side to the picture. The Government has undertaken important reforms to improve conditions for attracting investment and I would like to highlight some of these. The OECD Investment Policy Review of Ukraine, which we released last month, noted the progress made in opening the country to international investment. Foreign investors can now participate on an equal footing with domestic investors. The OECD also welcomes improvements in the business environment for investment. Establishment and licensing procedures have been simplified. The Investment Promotion Office has been created as a one-stop-shop to attract and embed investments. Progress in tax reform over the last two years has resulted in greater tax transparency and more efficient and effective tax administration. And earlier this month, the Government approved draft anti-corruption draft law submitted to parliament for ratification. The Investment Policy Review, as well as successive reviews of Ukraine by the OECD’s Anti-Corruption Network for Eastern Europe and Central Asia, highlight the breadth and depth of this challenge. Actions to address bribery and other forms of abuse of office are critical for Ukraine’s prosperity and we have made this one of our main priorities in Ukraine-OECD co-operation. A business ombudsman was set up in 2014 with OECD support. It is working well and is widely acknowledged as one of the most successful recent initiatives. Most of the 1,200 complaints received since its creation have been accepted for analysis and 76% of those accepted have been successfully concluded. The OECD has also worked with Ukraine on the establishment of the National Anti-Corruption Bureau and the Specialised Anti-Corruption Prosecutor’s Office, as well as civil service reform. Ukraine’s new e-Procurement system, known as the “Prozorro” system, which means transparency in Ukrainian, marks a further advance in the fight against corruption. These and other reforms are to be applauded, particularly given the difficult conditions in which they have been undertaken. But much more needs to be done. First, reforms need to be aimed at lifting unnecessary sectoral restrictions and simplifying regulatory procedures. With the total score of 0.117, Ukraine is more restrictive than the OECD average (0.068) in the OECD FDI Regulatory Restrictiveness Index - a score that reflects in part the fact that the country still applies numerous restrictions on national security grounds. Second, competition needs to be strengthened among various economic actors to level the playing field. As underlined in the Guidelines on Corporate Governance of State-owned Enterprises and the OECD Principles of Regulatory Reform, full administrative separation of responsibilities for ownership and market regulation is a fundamental prerequisite for creating a level playing field for SOEs and private companies and for avoiding distortion of competition. Third, the private sector needs to be itself involved in the implementation and monitoring of efforts to promote integrity in the private sector. Both the private sector and the government need to work hand-in-hand to shape up the transformation of Ukraine. Ladies and Gentlemen, this is a difficult and wide-ranging agenda. It will not be realised overnight. Yet a look at what has been done over the last years should remind us of what can be achieved, with strong political leadership, a society that demands far-reaching reform, and a supportive international community. The OECD is already deeply involved in supporting Ukraine, but it stands ready to do more. With our members’ support, we can continue making an effective contribution to address Ukraine’s challenges and priority areas for reform. Thank you very much, and I wish you an interesting and fruitful forum!